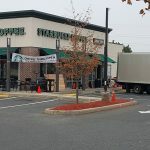 Another Starbucks renovation provided by JD Contractors, LLC took place in Western Mass in City of Chicopee. A 5-day long renovation started on early Sunday evening. 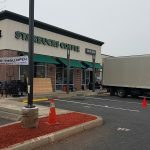 Our demolition crew got to work as soon as Starbucks partners closed the store, and start demolition of all furniture, casework, equipment, and finishes. All work was completed from Sunday night to Friday evening, making sure the café was closed as little as possible. 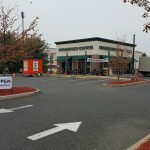 During the whole construction process, we were able to provide space for Starbucks partners to serve drive-thru customers. All the necessary equipment was placed into a small drive-thru space, well-enclosed from the construction area. Regular Starbucks customers still enjoyed their daily cup of coffee, while their favorite café was being remodeled. The store opened fully-renovated on Saturday morning, after only 5 days of café closure!